Slip and Fall Wrongful Death Lawsuits | Hupy and Abraham, S.C.
Can a Slip and Fall Lead to a Wrongful Death Lawsuit? 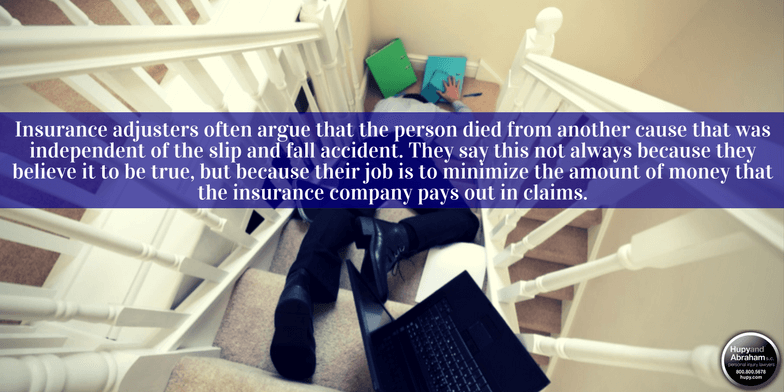 Sometimes the survivors of people who have died in slip and fall accidents are stunned to hear from insurance companies who claim that a slip and fall accident injury cannot be serious enough to cause a death. These insurance adjusters often argue that the person died from another cause that was independent of the slip and fall accident. They say this not always because they believe it to be true, but because their job is to minimize the amount of money that the insurance company pays out in claims. The property owner’s negligence caused the slip and fall accident. The slip and fall accident caused your loved one’s death. Consider, for example, what would happen if the person who fell suffered a significant traumatic brain injury, spinal cord injury, internal injury, or other injury in the fall. The devastating result could be death. We know that you are grieving now, but if your loved one died in a slip and fall accident then it is important to contact a lawyer as soon as possible. There is evidence that needs to be gathered now to protect your legal rights later. For more information about how to protect your rights and your potential recovery, please schedule a free and confidential consultation with us by starting a live chat with us on this website or by calling us directly. We look forward to providing you with the accurate and honest advice that you need to make an informed decision about whether to pursue this type of wrongful death case.